White or Gray: Does Ash Color Determine Quality Cannabis? Sherlock Holmes is said to have penned Upon the Distinction Between the Ashes of the Various Tobaccos as a guide to understanding cigar ash. Now, over a century later, armchair sleuths claim to have their own ways of reading cannabis ash. All across the Internet, cannabis boards rage with fierce debate and almost no scientific input over one of the most inane topics in cannabis: what does ash color mean for bud quality? The argument goes that properly flushed and/or cured (more on this in a moment) cannabis will burn to white, or near-white ash when combusted, and darker, blacker ash is an indication of inferior product. Most everyone agrees that cannabis should not pop or crackle when burned. There is some degree of disagreement over what constitutes “white” ash and just how deep into the spectrum of gray is still acceptable. And just what inferiority does ash color betray? Supposedly, darker ash means that chemicals used in the growing process are still present in the plant, which are ideally harmful to humans when smoked and inhaled. To help get to the bottom of the cannabis ash argument, let’s take a closer look into some key elements surrounding the subject. Is Flushing a Fraudulent Factor? The majority of proponents of the cannabis ash idea feel that white ash is indicative of cannabis that has been properly “flushed.” For those unfamiliar, flushing is the practice of feeding the cannabis plant only water in the last seven to fourteen days of growing in order to “flush out” any residual chemicals or nutrients used to bolster the growing process – synthetic salt-based fertilizers in particular. Flushing is such a common practice that the majority of growers consider it a standard step in the cultivation process, never to be skipped. Renowned grower Jorge Cervantes even penned an article on the importance of flushing. The majority of growers we spoke to agree, flush has a very noticeable effect. 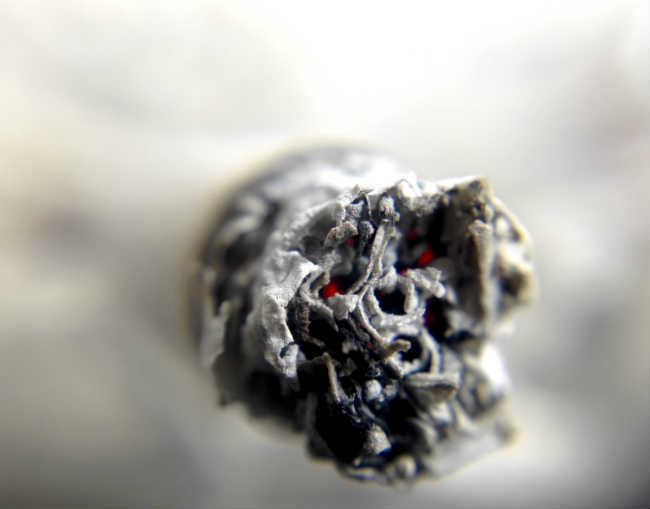 Many people believe that a proper flush has a large influence on smoke quality. Many growers say their bud burns to white ash regardless of flush, and that any properly grown cannabis will do the same. So, if ash isn’t a good indicator of flush, is it an indicator of anything else? Some proponents of the “ash test” claim that what it’s really showing is the quality of the cure. Curing is a process of preserving food against degradation and bacteria for later consumption. For cannabis, a cure is done to seal in desirable cannabinoids and terpenes, and thought to purge excess starch and sugar. While both deal with reducing the moisture content in flower, curing is distinguished from drying, as it involves carefully controlling the release of moisture from sealed containers over an extended period. The curing process has a large impact on the flower's smoothness. While we were able to find lots of anecdotal references and explanations of this process, we weren’t able to come across any hard scientific clarifications that back up the validity of the “ash test.” Curing undoubtedly results in a smoother, more flavorful smoke, but similar to flushing, understanding exactly why remains a mystery. The Cannabis Business Times covered similar Badertscher frustrations at understanding the underlying processes of cannabis curing, and offers some questioning to the commonly held beliefs here. The best understanding we could muster is that similar to fruit on a plant, harvested buds do not begin to immediately decompose, but continue to undergo metabolic changes for a period. By controlling the amount of moisture in the buds during this crucial period, growers are able to coax those metabolic processes into reducing undesirable elements out of the plant to increase smoothness. Moisture content is at the heart of the matter, which also unquestionably affects a bud’s smoke quality. Where Does the Ash Myth Come From? For how persistent the white ash test is in the cannabis world, its origins appear to have come from connoisseurs of a completely different crop. The insistence that white ash equates to higher quality product comes from cigar aficionados. The Cigar Association of America even notes the fact on their website. The story goes that when the US ceased trade with Cuba, imitation Cuban cigars flooded the market, and could be distinguished by their darker ash color. Tobacco grown in authentic Cuban soil was higher in minerals and nutrients, cigar historians argue, resulting in lighter ash. In modern cannabis grow markets, where nutrient content can be carefully monitored, and a variety of methods are used, ash color is unlikely to definitely differentiate or distinguish the quality of the source. Regardless of the exact processes that the ash test is meant to illuminate, one thing about the result is certain: if bud harshly fails the ash test, it’s usually a sign of something you don’t want to smoke. Bud that crackles when ignited, or burns to black and/or sticky ash tends to be harsher, and unpleasant to smoke. It is likely a sign of something undesirable on the flower. It is unlikely that well-grown and prepared cannabis would do much other than burn to gray or white ash. Conversely, you probably don’t need to be a snob about having ash as white as driven snow. So long as the smoke is smooth and flavorful, it’s probably good bud. Ash color itself requires further scientific inquiry to support the notion that it is a good determinate of quality, but there is a bit of worthwhile information one can learn from observing what happens when flower burns. What are your thoughts on the “ash test?” Do you feel that white ash is an indication of quality cannabis? Share your input in the comments below!